It all started with a piece of scratch paper. We had just been told that Fallout 3 would receive a fourth installment of additional content. That is pretty much all we were told, in fact. The two of us were asked to think it over and come back with ideas. The brainstorm sessions that followed were summarized on a messy piece of scratch paper containing a series of seemingly unrelated words: “Swamp, Boardwalk. Mansion Siege. Organ Thieves. Steamboat. Cultists.” The next few months would see those scattered concepts come together as what we feel is a fun and fresh new chapter in Fallout 3. With Point Lookout, one of our primary goals was not to create just a quest, but a whole new region for players to explore. Straight away we knew that we wanted to focus on what we felt was one of the great strengths of Fallout 3 –a world too full of stories and surprises, ripe for exploration and adventure. For us, the world is a main character, and choosing our location was intrinsically tied to the tone of the content. We knew what kind of geographical features we wanted to showcase, and began scouting real-world locations. We stumbled across the perfect place: Point Lookout, MD. This rural location is situated on the southern tip of Maryland where the Potomac River meets the Chesapeake Bay. The coastal lowland offered the setting that we wanted, and the area has a rich history that we were able to pull inspiration from. The founders of Maryland landed here, a Civil War camp held over 50,000 confederate prisoners, and the Point Lookout Lighthouse is purported to be one of the most haunted places in Maryland. All this just down the Potomac River, which runs through the Capital Wasteland. Once we knew where the content would take place, we set about the work of planning the world layout. We drew a few initial maps and decided upon our major landmarks. 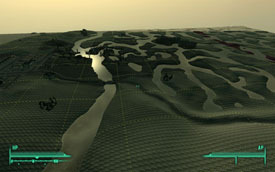 These landmarks were scattered around the map based on early quest flow ideas, to draw the player around the environment. The initial map ended up being very close to what the final world is now. Observing the original map, notice that even minor brush strokes influenced the final world. Dots became islands that someone had to build, lines became the edges of a river that flows through the world, and large shapes defined our coastline. We had to think of how this would all feel once it was made into a whole new region for players to explore, while being sensitive to exploration, visual impact, and gameplay pacing. 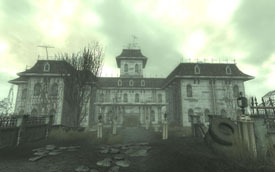 While defining the world, another important early job was to establish a unique visual style for Point Lookout. The Capital Wasteland has its own unique visual style: very dry and heavily damaged by nuclear blasts. Point Lookout is more rural, and it was not hit directly by the blasts. We also took some liberties with the history of Point Lookout, adding fictional locations like a boardwalk carnival. Taking such lore considerations into account, as well as the geographic features of the region, we went about establishing a new look. The team wanted to maintain consistency with the base game, but also explore unique visual themes. 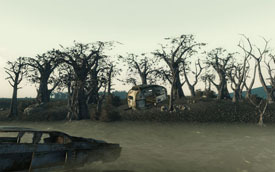 Point Lookout would depict rampant overgrowth and aging decay, in contrast to the Capital Wasteland’s visual themes of violent devastation and barren drought. 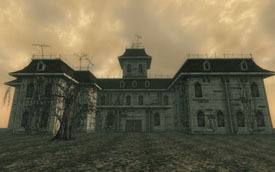 In order to establish the aesthetic for Point Lookout, we didn’t just start building the whole world at once, but instead focused on small locations that became “benchmark” areas. This way, we could make sure that we had the look that we wanted, proving our visual ideas. This is sometimes referred to as a “vertical slice”. Once a benchmark convinced us that our visual goals were feasible, the team would build the whole world using those themes, colors and density of clutter as a metric. We built two major benchmarks; a typical marsh area and the Mansion, which is part of the coastal cliff area. The marsh benchmark area is where we placed all of our new plant life and trees. While everything is dead and dry in the Wasteland, we wanted Point Lookout to be a region where plant life has managed to survive and proliferate in wet conditions. Team artists labored over new trees and plants that would define the area. These new assets had to sacrifice some of the detail of clutter from the base game in order to achieve a much higher level of visual density in Point Lookout. While things in the Capital Wasteland are spread pretty far apart, we wanted to capture the feeling of wading through a dangerous and dense marsh. A whole new set of landscape textures was created to get the dark and muddy feel that we wanted to achieve. Thanks to clever optimization, very few sacrifices were made to realize the team’s visual goals. The Mansion benchmark helped us define the look of both our buildings and the coastline. Most of the buildings in the Capital Wasteland are bombed out and destroyed, or built out of scrap metal. The structures in Point Lookout existed before the war and many of them are still standing, though severely deteriorated. Over the years, nature has taken the land back, slowly erasing man’s influence on this place. Instead of blowing out huge chunks of the buildings in Point Lookout, they are crumbling apart, vines growing over untended walls. These more-complete structures saved on polygons which were used elsewhere to achieve the high level of visual density the area required. Using techniques researched during The Pitt to procedurally grow steel cabling over a figure to create a sculpture, the growth of ivy, vines and trees was actually simulated throughout Point Lookout’s art. These techniques led to a much more natural look for the growth in the region. We had success in Fallout 3 and Operation: Anchorage building believable cliff areas. We were able to use the same techniques to build rocky cliffs along the Chesapeake Bay coastline. While these cliffs were an example of us taking liberties with the geography of the region, they create a dramatic visual effect and offer new, vertical opportunities for gameplay and exploration. These Eastern coasts provide contrast to the wetlands and the sandy banks of the Potomac along the southern edge of the map. These coastal treatments were important to Point Lookout being a robust region, with strong visual sub-regions that supported the overall goals of the project. Having established our visual benchmarks, the team was ready to start building out the rest of the world. Building a whole new region is a lot of work, but the team knew what it needed to look like and where everything needed to go. Every tree and rock in Point Lookout is placed by hand, so simply filling out the world was a significant effort. As the world-building team completed initial passes of the world, we held “World Walk” meetings that involved just running around the world and exploring it. We constantly gauged the feel of the world, the density of gameplay encounters, exploration rewards, and general points of interest. Thanks to these meetings, we knew when and where to add additional points of interest or tweak the ones what the team already had created. Many of the guidelines that we used in Fallout 3 for density simply didn’t apply to creating a swamp. While the Capital Wasteland is spread out and desolate, Point Lookout is much denser. 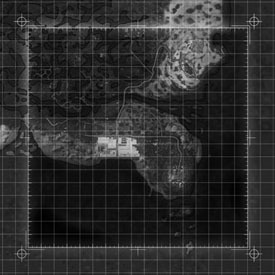 The new region is more populated, there is a much heavier fog, and points of interest and encounters are much closer together. This density in Point Lookout created new gameplay problems for us to solve. 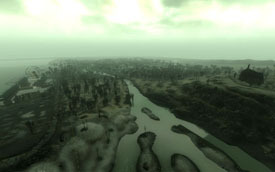 Traversing a certain distance without an encounter in the swamp felt empty and unfinished compared to traversing a similar distance in the Capital Wasteland. 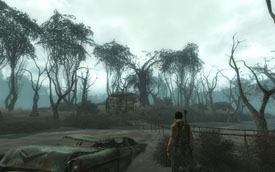 Enemy AI in Fallout 3 makes some assumptions based on the environment, several of which were invalidated by the dense nature of Point Lookout’s wetlands. The design team was able to work around this by making use of tools such as guard behaviors – which allow enemies to detect threats, but hold off on attacking until the threat comes within range or attacks them. Some encounters are staggered based on other events or quests in the area being completed. Thanks to this extra effort, we were able to populate the swamps with a suitable number of encounters to complement the pacing of exploration, without encounters crowding each other in the space. As the world came online and was being fleshed out, it was important to work on special, major points of interest to serve as visual high points and landmarks to help the player navigate Point Lookout. Some of these major locations are the Lighthouse, the Boardwalk, the Cathedral and the Steamboat. The Steamboat and the Boardwalk area were especially important, because they are the first things the player sees when arriving in Point Lookout. While most members of the art team worked on several locations in Point Lookout, the Boardwalk area was such a significant piece of content that it required the full attention of one artist for the entire project, as well as involving several other developers across all disciplines. New music was even composed to introduce this area and set the tone of Point Lookout. Quests and other story content also placed demands upon the design of the world. The history and character of Point Lookout are ripe with inspiration. New ideas which stemmed from the environment were expected and welcome, so we had left time on the schedule to account for unanticipated ideas that we just had to implement. 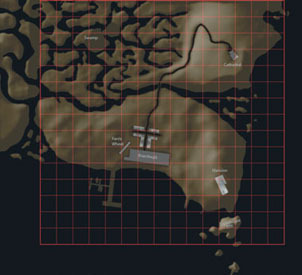 New locations, such as a top-secret military camp hidden in the rural woods needed to be built and placed while still taking into account and preserving the overall structure and flow of the map. Here at Bethesda, we believe that iteration is important to all aspects of game development. This applies to quests, level flow, world design such as we’ve discussed here, and more. This includes the creation of important set-pieces, such as the Steamboat which transports the player to Point Lookout. Such assets are much layered in their construction. First, an artist blocks out the major shapes with pre-existing assets or simple geometry. This lets us get a feel for scale and make sure that it plays well and has a good feel in-game. Once we’re comfortable with the basic shapes, detail modeling begins, then texturing and finally details. Assets are constantly reviewed throughout these stages and often revised for visual and gameplay concerns. For example, the main cabin of the steamboat was made into an open interior, though in the original block-out it was closed and would be loaded as separate, interior space. Once the meshes are complete, we do a clutter pass in the GECK, adding bits of paper, signage, and furniture and so on. Point Lookout wouldn’t have been complete without characters to populate it. The setting yielded no shortage of ideas for new enemy types and characters, but with finite resources we had to be selective about what work the team could take on. Tobar is the Steamboat ferryman, and this grafter is one of the first characters the player will meet. He received a custom outfit to match his unique and ebullient personality. Point Lookout is also home to a group of transcendental Tribals, who received new garments to help reinforce their beliefs and set them apart from citizens of the Capital Wasteland. Perhaps most involved was our new enemy type; the Swampfolk. These denizens of the marsh are descended from the reclusive natives of the swamp, inspired by Bayou legends and other modern myths. Everything about these enemies was a challenge – we chose to embrace a certain amount of humor in their presentation, but they needed to be dangerous, yet still human. They’re people, albeit mutated by radiation and deformed by generations of poor breeding. These new enemies are as much a part of the environment as the shacks they inhabit, and help reinforce the sense of place which is so important to the player experience of Point Lookout. At the project progressed, we had built the world, its major points of interest, and populated it with characters and creatures both new and old. The final product ended up being very close to the initial vision that became Point Lookout. What started life as a scribbled series of words has now become a whole new region and part of Fallout 3. We hope you’ll find as much intrigue, fun and challenge in Point Lookout as we encountered building it.